Former Minister of Aviation, Femi Fani-Kayode, has stated that the only way the leader of the Indigenous People of Biafra (IPOB), Nnamdi Kanu, can defend himself in court, is if the Nigerian military produced him. Speaking after Kanu failed to show up for his court case on Tuesday, Fani-Kayode revealed that he got information that soldiers killed up to 28 people, before the IPOB leader went missing. “In order for him to be prosecuted effectively and for him to present his own defence, I call on the Nigerian Military to stop this charade. If he is with you, give him back to us, so he can be produced in court. And if you have killed him, give us his body. “No matter what threats we face, I can never not stand with a friend. 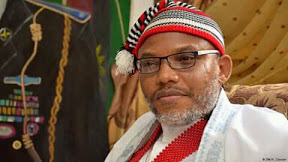 “I pray for Nnamdi Kanu and I pray for his family. “The allegation that 28 people were slaughtered in his home when the Military got there, is something that is shocking and unacceptable. I gathered that some of their guests, their works, even their dogs were butchered. “I also gathered that the cars were burnt and the palace was sprayed with bullets. “Now this is the information I have received and we have not seen my friend ever since then,” he said.